This sequence of cmdlets shows a contradiction between items 1 and 2, and the fix in item 3. The first cmdlet corresponds to dism /online /cleanup-image /checkhealth. Note: it returns a positive result for “ImageHealthState” (“Healthy“). Once the afore-cited cumulative update is applied to the online image, however, the third cmdlet now works! It corresponds to dism /online /cleanup-image /restorehealth. This clears the error condition, and shows that KB4016871 fixes spurious Win10 DISM issue at long last. We know this because ImageHealthState shows as “Healthy” upon completion. Apparently, the cause of this issue is that the TestRoot and FlightSigning Package file identifies a specific bit of staging and version identification data. In fact, Windows Update uses it when running the Unified Update Platform (UUP) to decide what updates to download. 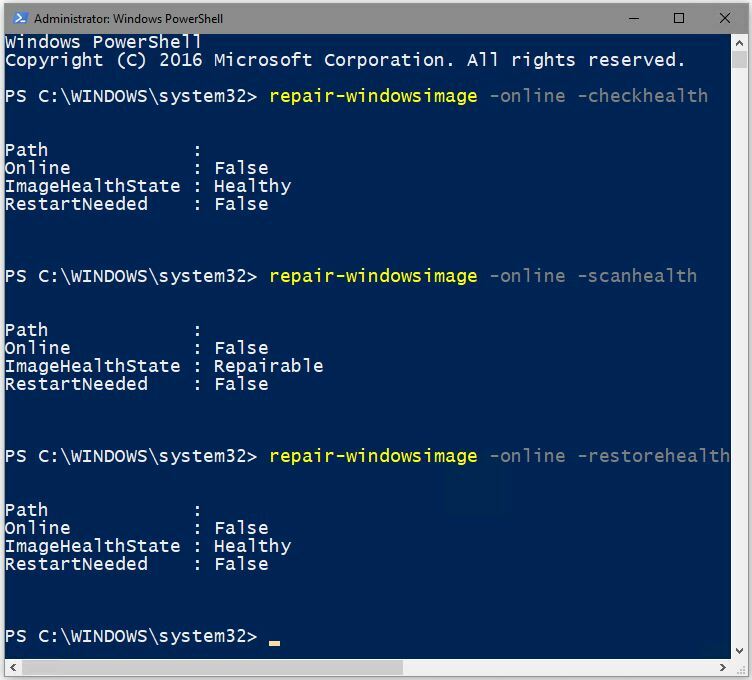 Thus, it’s not really part of the Windows Image file itself and, though referenced, doesn’t turn up when a deep health analysis runs against a targeted Windows image. This produced some kind of error in an earlier release of Windows 10 Current Branch, but is now rectified with Version 1703 (Build 15063.296). One must still run the final cmdlet or its native DISM counterpart to finalize that fix, though. It would seem that the ‘source not found’ error was not just referring to finding the source on the local PC, but also to a failure to find a valid download for the package on MS’s servers. This would appear to be what @s0urce says MS have fixed ‘internally’. Whether or not KB4016871 is a prerequisite is a moot point (I suspect not). What is essential is to run DISM once more now that MS have fixed things at their server end so that the working packages can be downloaded and the repair completed to 100%. 2017-05-20 10:08:53, Info CBS DWLD:Content is Full-Cab package. 2017-05-20 10:08:53, Info CBS DWLD:Content is Express package.